Due to being short on time again today, I am reposting a blog piece I had written and put on the Evergreen Garden club at the end of August in 2016. Looking back at the date, I realize now that the post foreshadowed my dissolution of the club (after 13 years) in June of 2017. Now, I have experienced a summer at yet another school, in another district. So, I’ll share my thoughts on that after this piece about community gardening at Evergreen. “School starts tomorrow! Are you ready? Hopefully, you all had a chance to get outside and explore during June, July, and August. Did you grow any plants? Harvest any vegetables? Release any monarchs? Or, find any cool bugs in your garden? I anxiously await your stories! For our family, summer went fast, as usual. 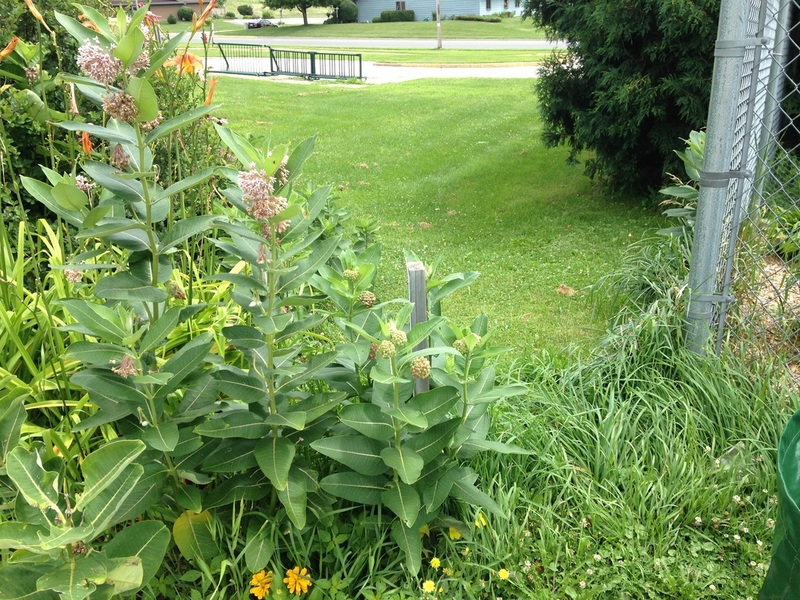 For me, the toughest part of summer is seeing our Butterfly Garden at Evergreen Elementary become weed ridden. As most of you know, I live right up the road. So, I pass school everyday. I can see the weeds growing taller and stronger, blocking out the color of the flowers and reducing air circulation. It gets to the point where I have no choice but to personally do something about it. So, I do eventually take action, just like I have in past summers. I go and weed the garden. I don’t really mind it. I like the solitude of the garden, putting my hands in the dirt, and tugging out the weeds. I love how it always looks better when I am done. 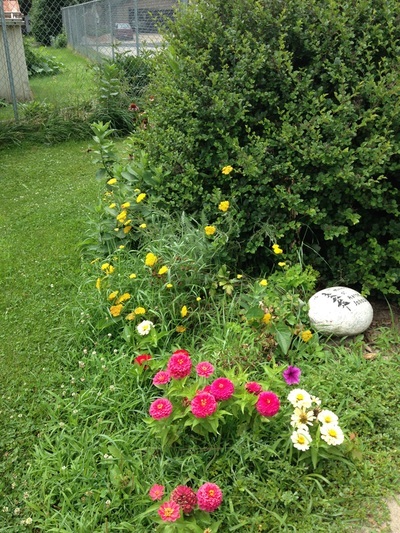 But, a key issue here is that it never seems (or looks) done, despite 10-15 hours of weeding every summer. This summer, it bothered me that I was alone in my work. I looked around at the schoolyard at Evergreen. I love this building and the teachers my boys were privileged to receive instruction and nurturing from during their elementary years. However, many times, the grounds need care. Yes, the grass gets cut. Occasionally, the curbs get cleaned. Yet, there is much more that can and should be done. In my opinion, the outside of the building and grounds reflect how much it is valued. Ours looks like it is not. Please note the word “ours”. I truly still want to feel a part of the Evergreen family, yet I find myself tiring of trying. Lately, I have had to try hard. The butterfly garden and garden club have been my contribution and link to this school for over a decade. Admittedly, my loyalty has not been enough to satisfy me this year. A few things contributed to my recent angst. 1) Our farm to school bed, one that the district likes to boast about each building having, was a mass of weeds up until two days ago! If there is pride in having these beds, why is ours not cared for? 2) The Autumn Blaze Maple that provides such wonderful fall color was damaged in early to mid-June, with a large branch being ripped from the trunk. Thanks go to the building and ground staff for removing the limb. The tree continued to grow and thrive. I seriously do not want to consider the possible causes of the limb breakage. 3) The same tree finally met its demise during the horrific storm in early August, when it was completely blown over. I am sure the earlier summer damage contributed to the tree’s inability to withstand the storm. What’s the big deal about the tree? 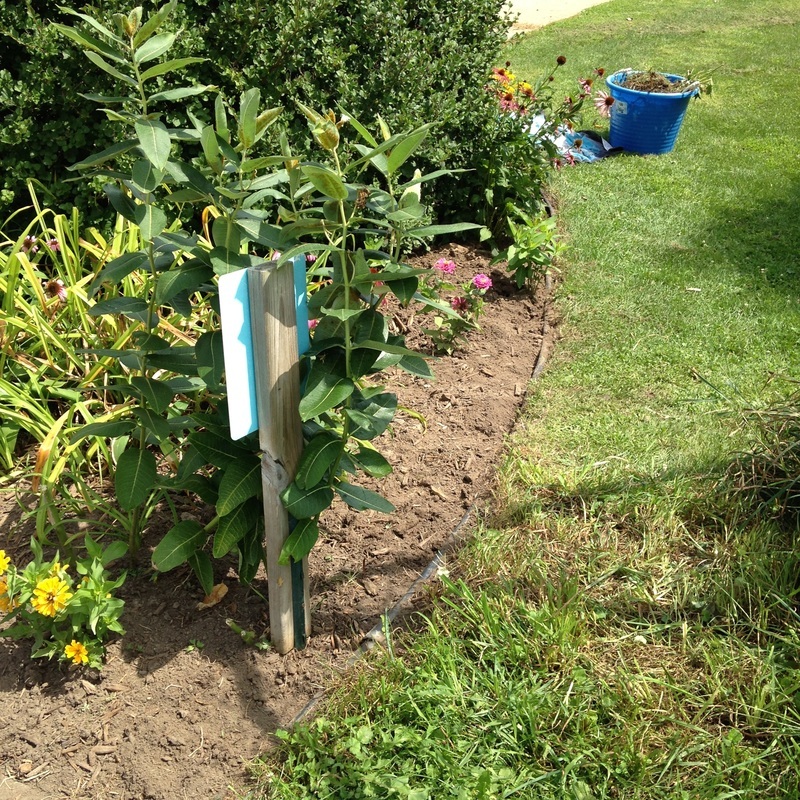 It is a tree that past garden club students planted. It is a tree planted with the purpose of providing a shady spot for perhaps a class to listen to their teacher read a story on a warm spring or fall day. I know I gathered garden club students under that tree on more than one occasion this year. Despite never seeing another teacher partake of its shade, furthering the fulfillment of the tree’s purpose, I will miss that maple tree. After all, I helped our students (including my own son, Matt) put it in the ground. It was well planned, cherished, and now gone. I feel alone in my bereavement. I feel sure some staff do not even know how or why such a young tree was on our school grounds, let alone it had a purpose. Likewise, some of you might not know that in years past, parents of garden club students would come to help me weed the garden periodically in the summer. At the risk of leaving someone out, I will just thank you all. I know who you are and how you helped me in the garden. There were parents, a few teachers, two administrators, and some high school students. You were appreciated. I hope I told you how much. I know I was overjoyed to receive help from the Filips family this past week in refreshing the garden just before school begins. Please thank Lisa and the girls, if you see them. A thank you goes a long way. I know it is a small thing but important to be told. When I was weeding solitarily this summer, I reflected on what it means to run a community garden like the Evergreen Butterfly Garden and Garden Club. This year, I will be seeking some more community involvement to tend the garden. The community to which I refer mostly entails the parents & families of the students who attend garden club. I could also include teachers, high school students, and other master gardeners. Please be alert to opportunities to help. I do not want to lose what has been built at Evergreen. Truly, I feel garden club lessons provide a unique experience in interdisciplinary, experiential, and place based learning for students. Garden Club has been a large part of my life and my largest community contribution. So, I ask you, is it valued? From looking at our grounds, I am not so sure. I am not asking for compliments here. I know there are those who appreciate what I do for this community and our students. I thank you for your many years of support. I am just asking anyone reading this to take the time to think about whether it is important or not to have an offering like Evergreen Garden Club at our school. I have had the chance to speak with educators from around the state this past year. Many are in awe as to what as been accomplished by Garden Club and, as much, in a state of shock when I reveal that I feel dwindling support for our group. So take some time. Think about your students. Think about what kind of experiences you want them to have. Think about in class discussions and out of class experiences. I have done my thinking, and within this writing, have shared my thoughts. A new school, a new garden, not quite as solitary. Reading this previous post, my own words still tug at my heartstrings. I left Evergreen in June of 2017, dissolving the club. By October, I had found a new position, almost unintentionally at another elementary school in a neighboring district. 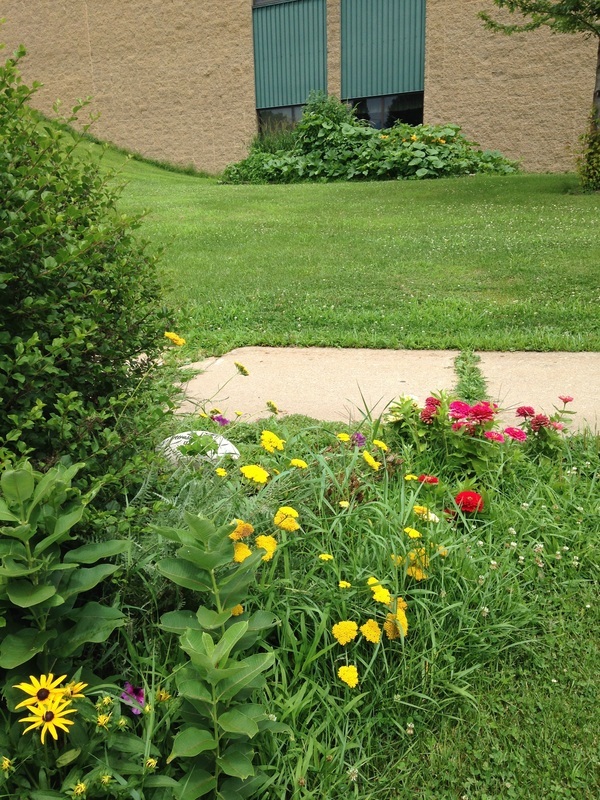 While I could make many comparisons of the two schools, I will just focus on the summer garden maintenance. 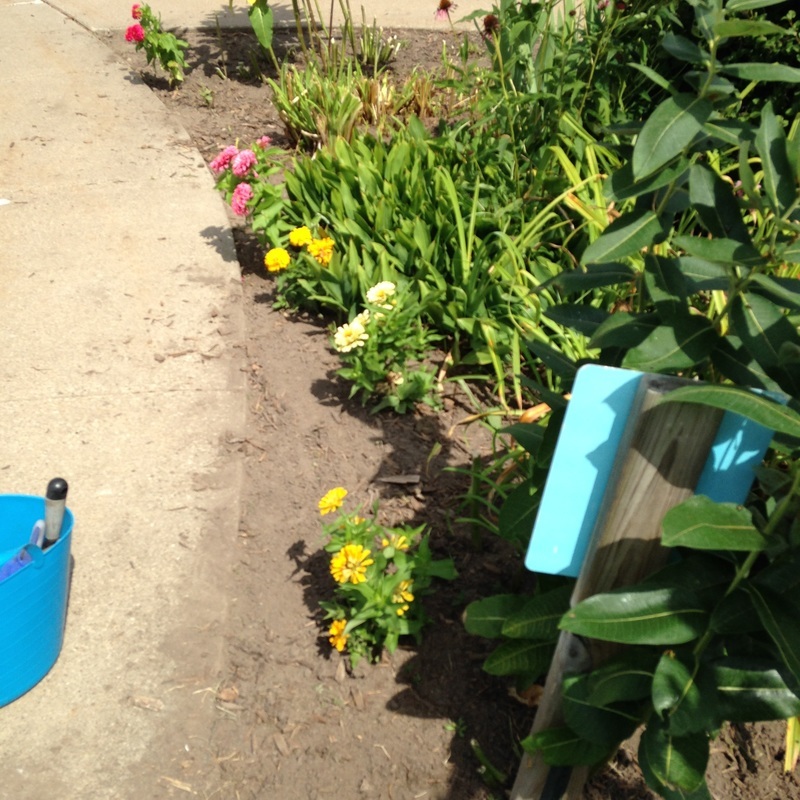 My new position includes pay to maintain the garden beds during the school year. But, mine is a school year contract. By early June, my contract had been completed. This was not a problem, I told my new administrator, I would come and weed the gardens (which are ten fold in size as compared to the one bed at Evergreen) during the summer as needed and accrue the volunteer hours necessary for my continued Master Gardener certification. I was no longer being paid, so I could act as a volunteer. It is also just who I am. I typically, do not take the attitude of “that’s not my job.” I finish what I start, even if there is a cost to myself. By the end of the school year, I thought I had some support from an outside group (a business joining forces to aid the school with volunteers). The person in charge of this group asked me to contact him with a list of dates/times when his employees could meet me in the garden and help. I did so – several times. However, I never heard back! Finally, by the time self-imposed July meeting with the school’s principal rolled around, I was told the group had backed out. Thanks for letting me know! I had counted on these adults to help and now was disappointed. Luckily, I had also tried to enlist some help from parents and each time a sign up went out, I was fortunate enough to have at least one parent contact me to help in the garden. Over the summer, there were five other adult volunteers that came at least once to help weed. I was enormously grateful. An unusual volunteer came in the form of the principal who was the administrator at Evergreen while my younger boys attended that school. What a huge heart for this person to have to come and help me at a school to which she had no affiliation, past or present! It still makes me smile to think that our friendship has blossomed while working together in that garden. My husband also helped and is not counted in the five adult volunteers but his assistance was also greatly appreciated! But, most of the weeding at the new school was still performed in a solitary way. It was maintained in the best way I could, despite the odd weather patterns of rain and heat that we experienced this year. Still, at times, it was messy and full of uncontrolled weeds. There was a bike in the back that was there as a decorative element but became buried in phlox and milkweed. I never was able to clean that out until yesterday! Fall garden maintenance has started! These gardens are beautiful. But, they are extensive. My husband estimates to maintain the gardens in pristine condition all summer would take 10-12 hours a week. I did not put in near enough hours. But, I tried not to be hard on myself. It is what it is, as they say. And, with 13 years experience of gardening at another school, I got some of what I expected and more of what I didn’t! Helpers did answer my call. I am grateful to them. But, I am wondering what the expectation is for me and the gardens at this school. Do they value their maintenance over my lessons with the students? I aim to find out this fall as I hope to administer a survey to the staff. How do they know help is needed if no one tells them? Perhaps, letting the gardens get a little messy is part of the solution! There’s a bike in there somewhere! Really, there is! There it is! It was right in front of the window!